The tech giant revealed the latest uptick in R&D spend in a regulatory filing with the U.S. Securities and Exchange Commission on Tuesday, which served as record of the company's record-breaking June quarter. Apple's allotment represents 7 percent of the company's $53.3 billion in net sales for the period. The figure is up from $3.4 billion Apple earmarked for future projects over the course of its second fiscal quarter and well ahead of last year's third quarter outlay of $2.94 billion. Apple typically allots between 4 percent and 5 percent of a quarter's net sales to R&D, leaving the 7 percent spent during the most recent quarter as somewhat of an outlier. During the same time last year, a quarter prior to the unveiling of iPhone 8 and iPhone X, the company put 6.4 percent toward such expenditures. In any case, Apple's spending on R&D is steadily increasing as rumors of new products swirl. Apple is widely rumored to launch three new iPhone models later this year, two of which will boast OLED screens. A follow-up to the current 5.8-inch iPhone X is expected, as is a new jumbo-size 6.5-inch "iPhone X Plus." An LCD-equipped 6.1-inch model is rumored to anchor Apple's fall lineup, with the mid-tier handset supposedly set to debut in a range of chassis colors including yellow, orange and blue. Earlier this week, a pair of dummy iPhone models popped up online, offering what could be the first look at Apple's 6.1- and 6.5-inch smartphones. In addition to iPhone, Apple is widely anticipated to launch revamped iPad Pro products sometime this year. The company's flagship tablet line has not been updated since its release at WWDC 2017 more than a year ago. Face ID technology is expected for inclusion in this year's iPad Pro refresh, which could see a slight redesign that swaps out the current Touch ID home button to make room for an 11-inch edge-to-edge display on the smaller model. Rumors shared this week suggest Apple will drop the headphone jack and relocate the Smart Connector to accommodate both landscape and portrait use. Apple's wearables are due for an upgrade this fall. 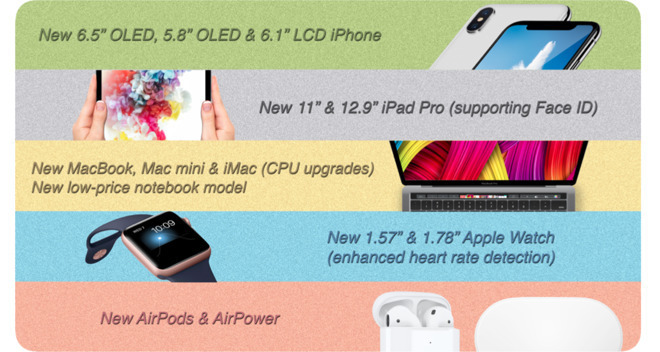 According to analyst Ming-Chi Kuo, Apple Watch will benefit from larger screens — and potentially larger frames — with enhanced heart monitoring functionality and extended battery life. Next-generation AirPods and a high-end over-the-ear headphone are also in the works, though a release date for the latter is not expected until late 2018 or early 2019. New Macs are also in the offing, including a revamped iMac and — much to joy of many — Mac mini. Further out in Apple's alleged product pipeline is an augmented/virtual reality headset that could see the light of day in 2020. Referred to internally as "T288," the device supposedly integrates two 8K displays, a separate computing unit connected via WiGig 2.0 or 802.11ay, and Siri voice control. Apple is also said to be working on health-monitoring technologies like a glucose sensor for Apple Watch and a smaller HomePod speaker. Also in development is self-driving car technology spawned from Apple's defunct "Project Titan" initiative. The company is currently testing the tech in a fleet of 66 autonomous vehicles driving on California roads, with reports claiming the solution will ultimately end up in a self-driving shuttle that ferries employees between Apple campuses. Including R&D, Apple reported total operating expenses of $7.8 billion, or 15 percent of net sales.